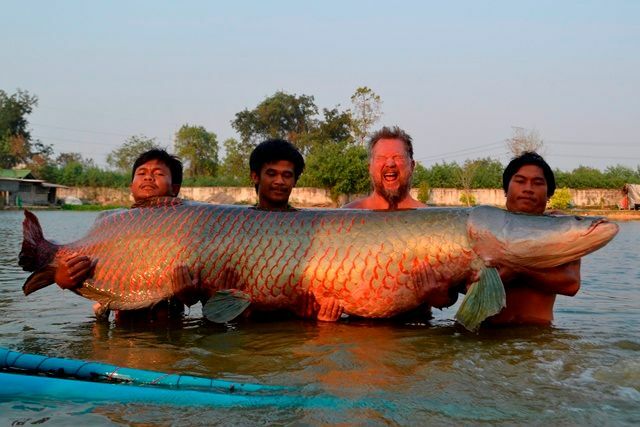 Johnny and Tuula from Finland returned to Palm Tree after a two year absence and didn't hang about quickly making up for lost time as he became the first angler in 2015 to join the 400lb arapaima club with a monsterous fish of 480lb. 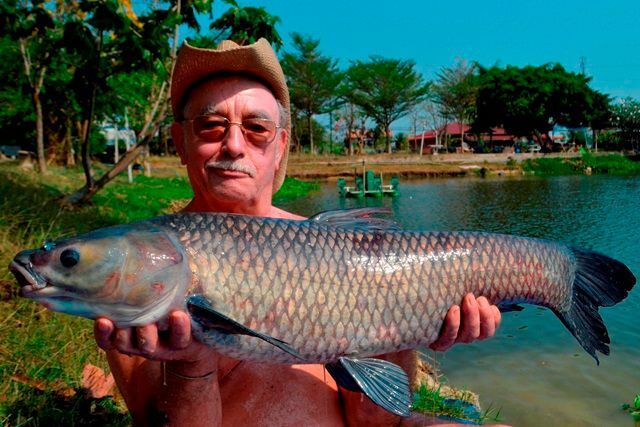 He also caught some Amazon and Thai redtailed catfish, Siamese carp, one of the largest striped catfish caught to date; and bagged up down at the Palm Tree Barra ponds. 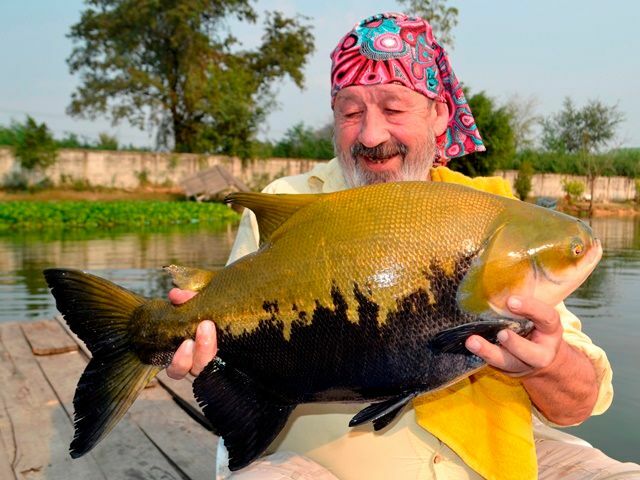 Darren Stock was back again and the smile said it all as he finally got was he has been after a big Siamese carp and at the same time joining the Palm Tree Lagoon 150lb Carp club with an awesome 156lb specimen. 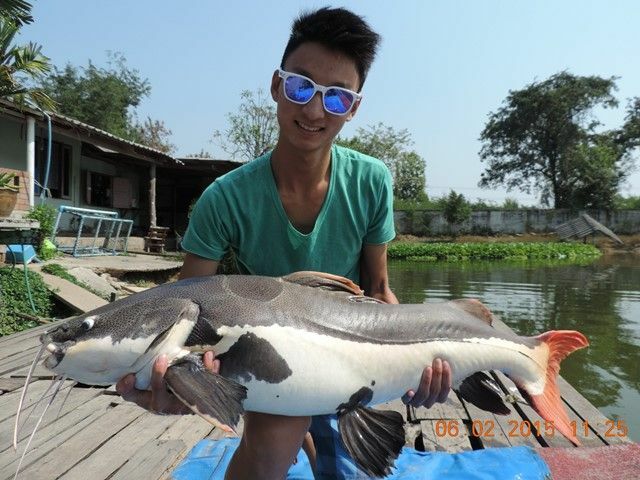 He also caught several other small carp, striped catfish and mollycot. 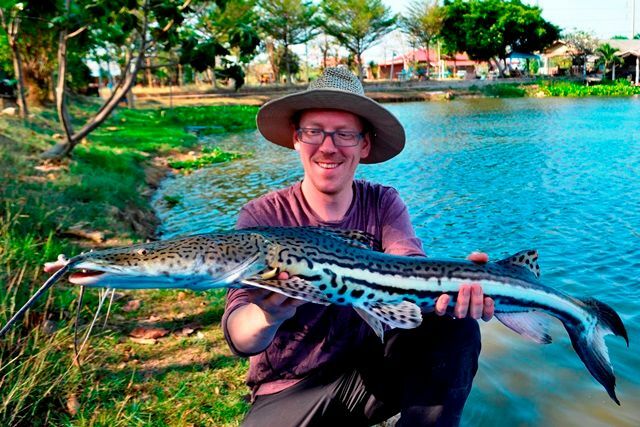 Sebastian Furnrohr visited Palm Tree for the first time catching an amazing variety of fish that included a rarely caught firewood catfish. 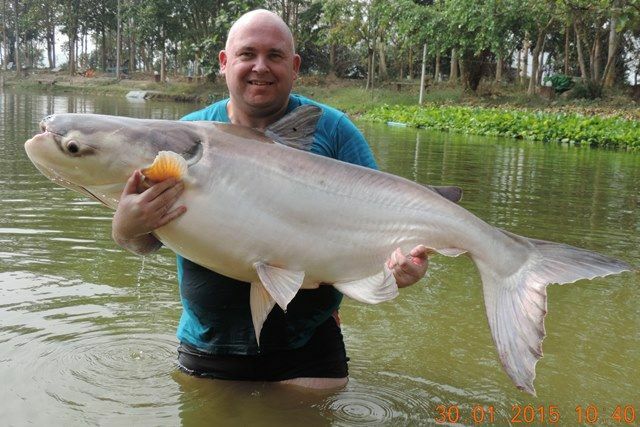 In addition to this he also caught albino striped catfish, wallago attu, rohu x black shark minnow cross, both leopard and tiger catfish, Siamese carp, pacu, mollycot and a number of impressive Amazon redtails. 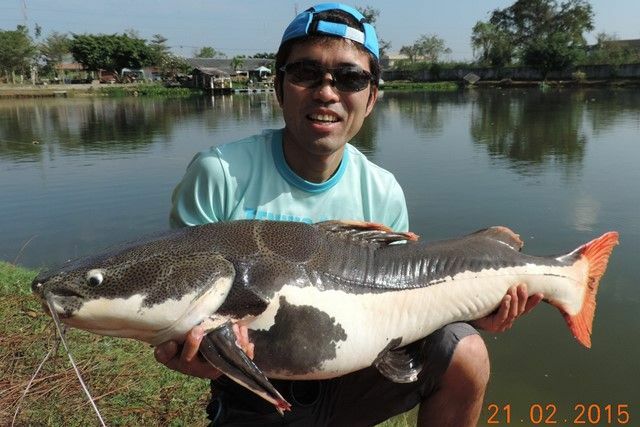 We also had our first Japanese angling customer to join the Palm Tree 300lb Catfish club during the month. It was definitely the case of all smiles after a successful gruelling two hour plus epic battle. 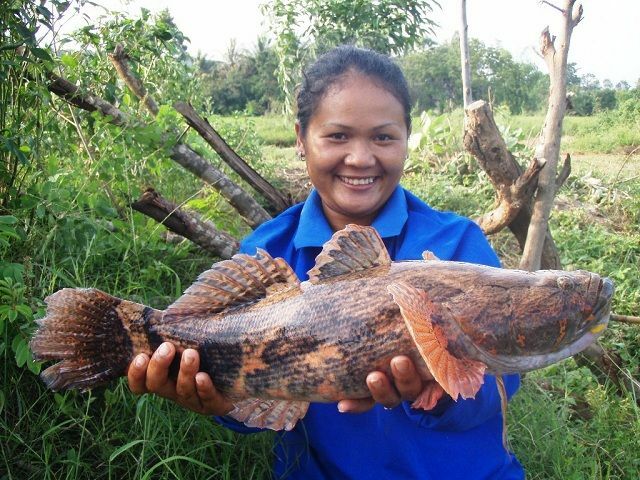 They also caught leopard catfish and tiger catfish. 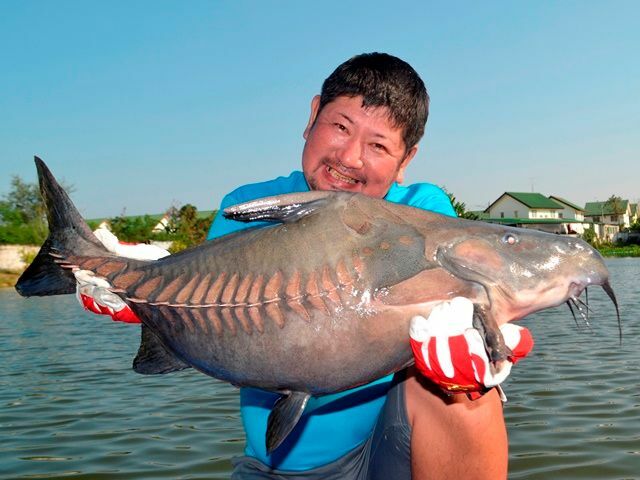 Another couple of enthusiastic Japanese anglers Akira Kawakami and his friend, got right into the fish and in the process caught a lot of new species and achieved a number of pb's. 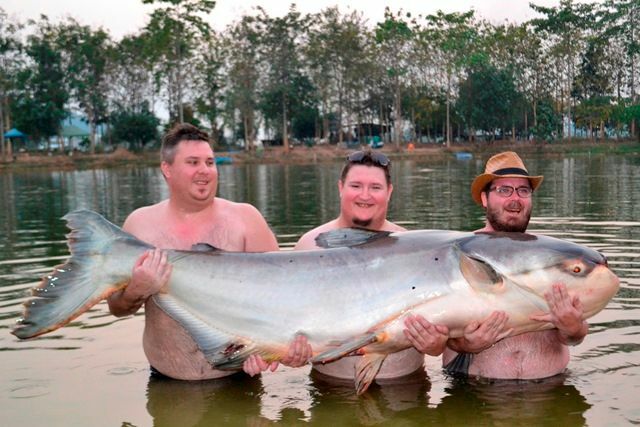 Between they they caught stingray, Amazon and Thai redtail catfish, crystal eyed catfish, ripsaw catfish, rohu, Siamese carp, leopard catfish as well as a number of striped catfish and catfish shark. 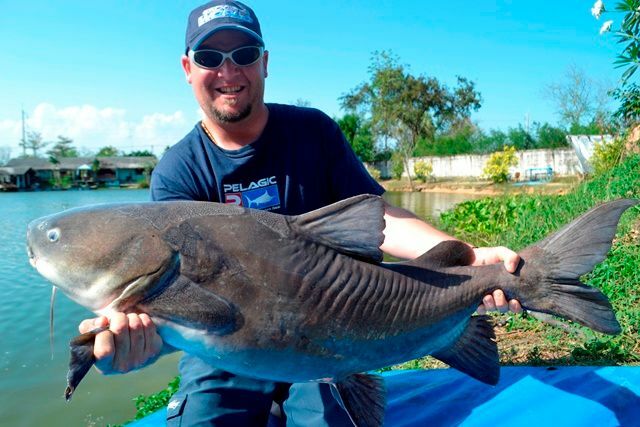 West Australian angler Jordon Reid was off to a terrific start with a 20kg+ Salween rita catfish, but he didn't stop there catching mekong catfish, clown featherback, wallago attu, Amazon and Thai redtail catfish, catfish shark and striped catfish. 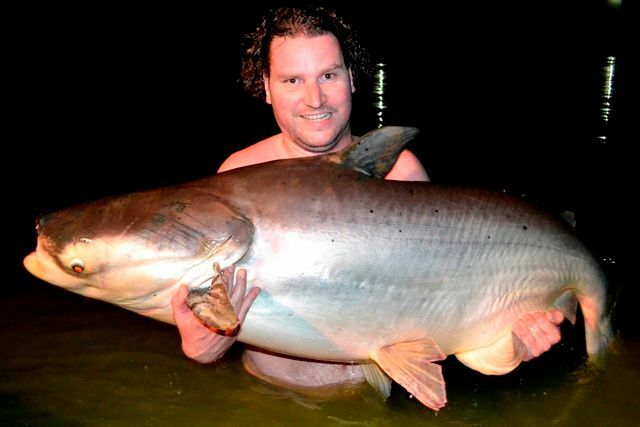 Martin and Markus Huuhka and Mikael Lestrand also visited the Palm Tree Barra ponds and had no trouble bagging up with Martin catching the biggest fish that weighed in excess of 12kg. 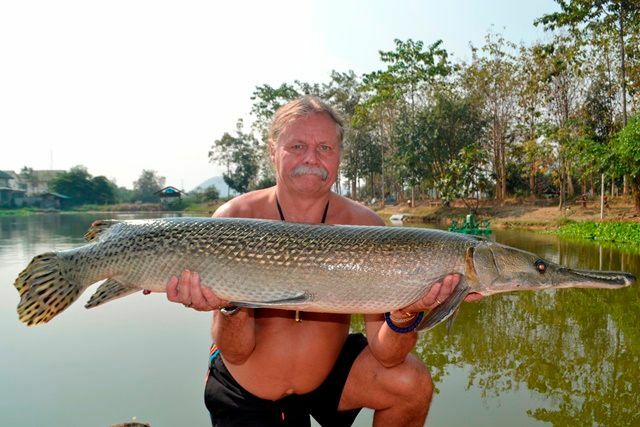 Plathong of Pattaya Fishing Guide Services was also back at Palm Tree with another German angling customer. 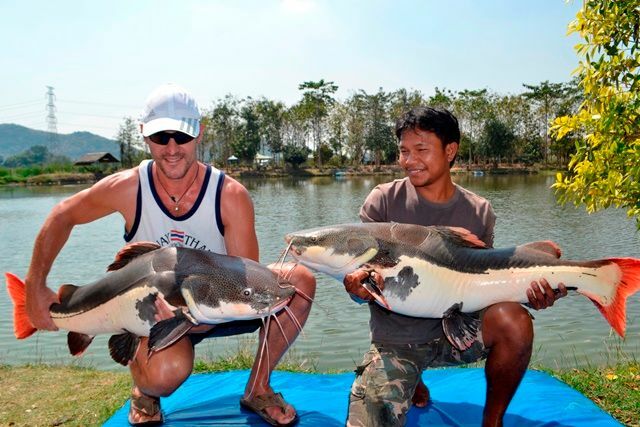 He spent most of the day battling with a number of mekong catfish as well as catching Chinese black carp, chao phraya catfish, rohu and Amazon and Thai redtailed catfish. Tap of Bangkok Guide Service was back with another customer during the month. 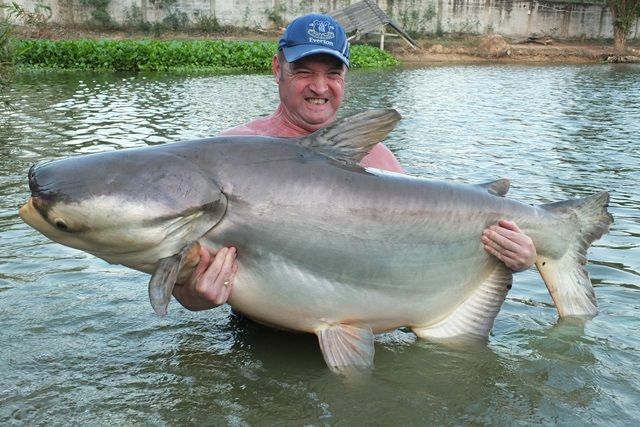 He thoroughly enjoyed his visit catching a myriad of species that included giraffe catfish, tiger catfish, pacu, Siamese carp, Amazon and Thai redtails, striped catfish and catfish shark. 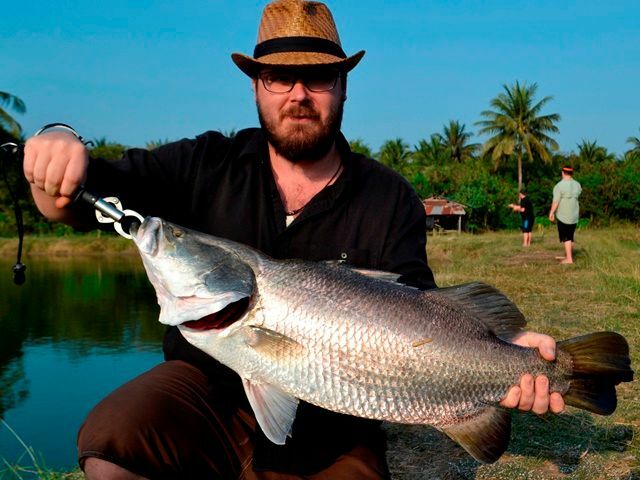 Tim was fishing worms around the margins and caught a number of tiger catfish, Indochina featherback, alligator gar, rohu as well as some barramundi from the Palm Tree Barra ponds. 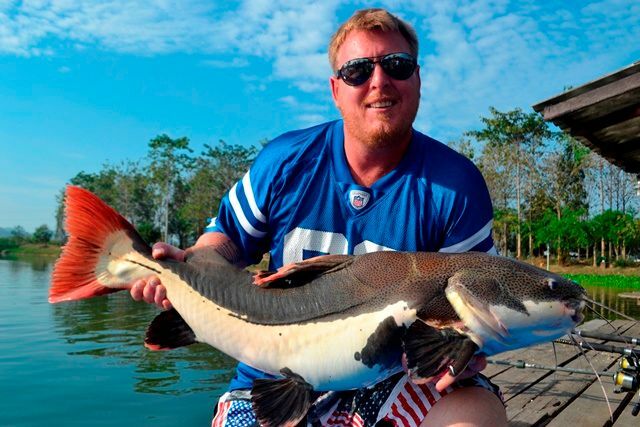 Dutch angler Marinus Niewold had a number of good sized Amazon redtails as well as the biggest catfish shark ever caught at Palm Tree Lagoon, he also caught rohu, striped catfish and mekong catfish. Mick Hazlehurst who hadn't fished for more than 10 tears came down with Yasmin Salamat and was soon back in the swing of things. 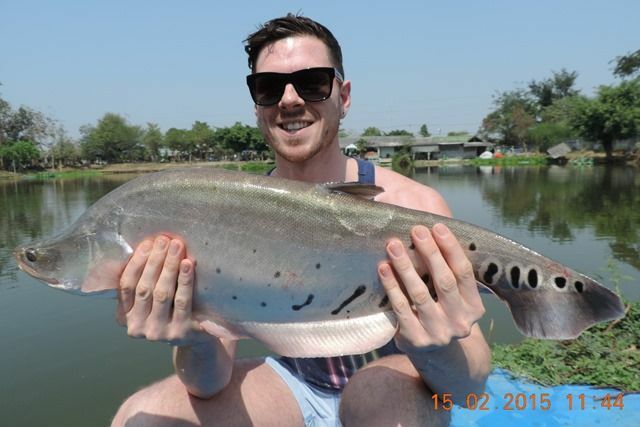 Having never fished in Thailand before every fish was obviously new to him and he caught a variety of fish that included Amazon redtails, an awesomely marked clown featherback, srtriped catfish, catfish shark, mrigal and mollycot. Benny didn't has much time for fishing this month but did manage to catch a 3.3kg marble goby as well as the first flagtail to be caught from Palm Tree for over a year. 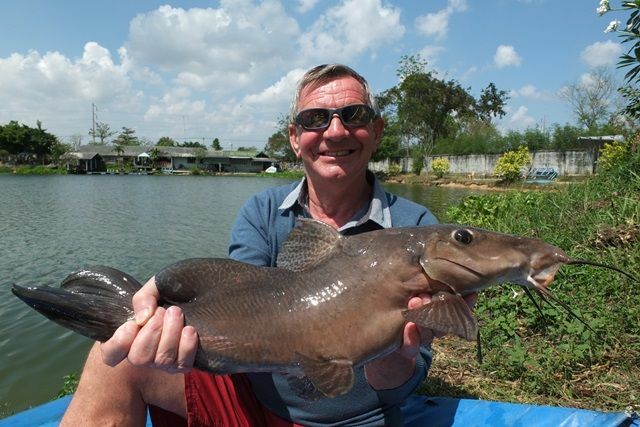 Terry Eustace ably guided by Neil Robinson of Khaolak Fishing Tours was also after some new species that he had not caught before. 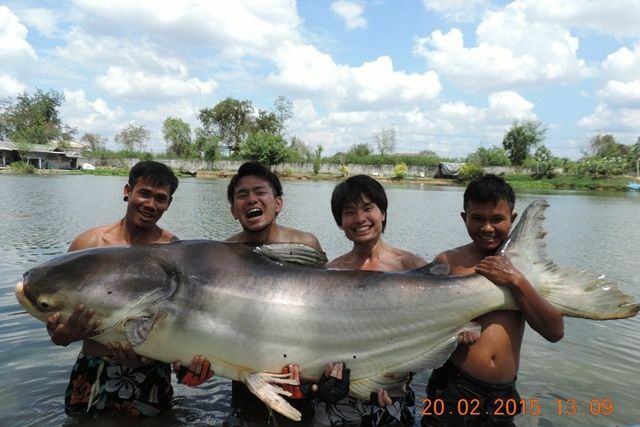 Two of them on his wish list were tambaqui and black ear catfish which he successfully managed to catch. 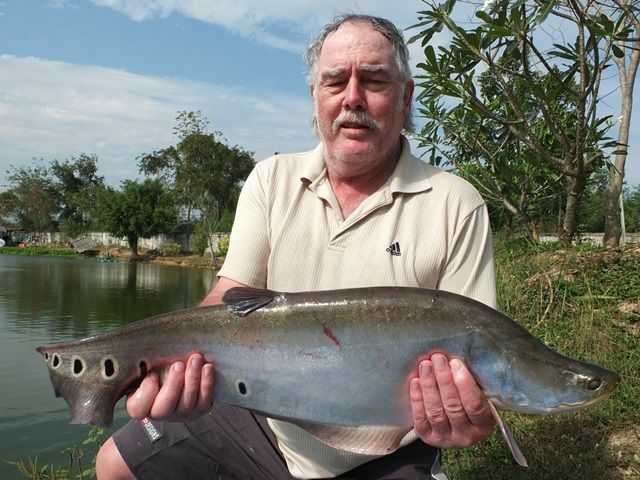 He also set pb's for rohu and African walking catfish and caught a number of striped catfish. 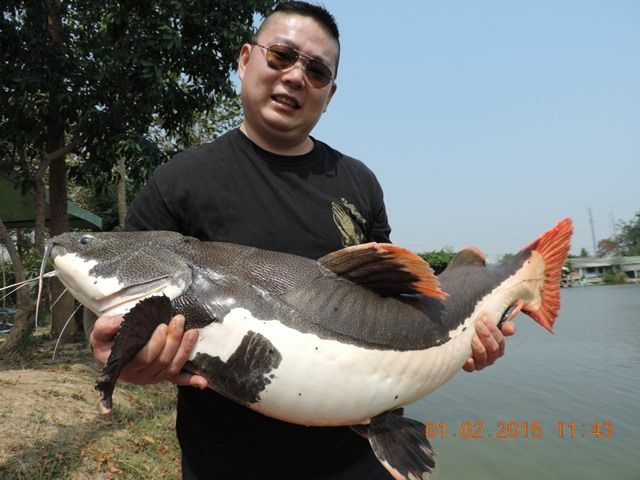 Eugene Cheng made his first visit to Palm Tree during the month catching several Amazon redtail catfish as well as black shark minnow and striped catfish. Wayne Pigott also got into the Palm Tree redtails that included one awesome specimen. 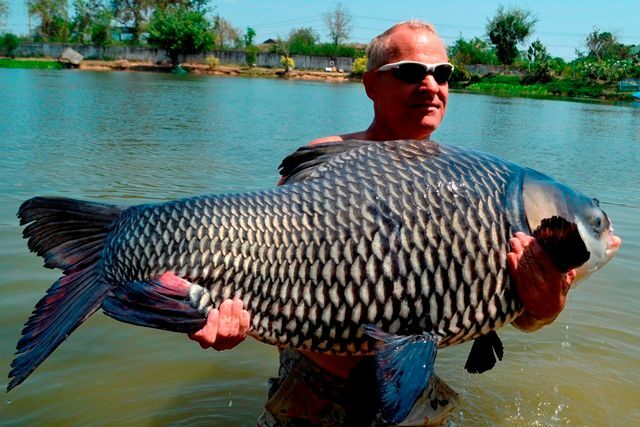 David Brewster and Alan Jones bagged up on Amazon redtails as well as catching some Siamese carp and rohu. 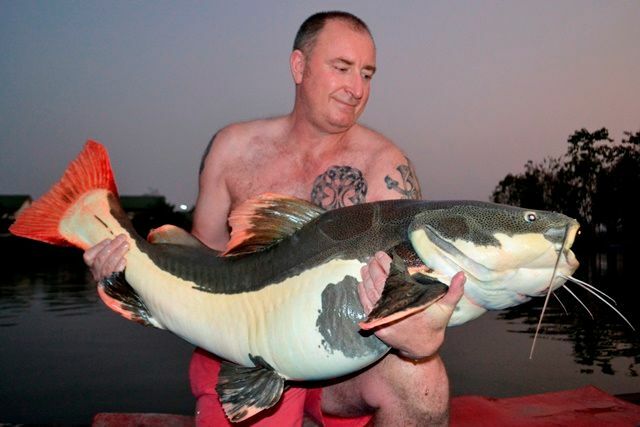 Lee Dibble made his first trip to Palm Tree catching Amazon redtail catfish, striped catfish, rohu and Siamese carp. 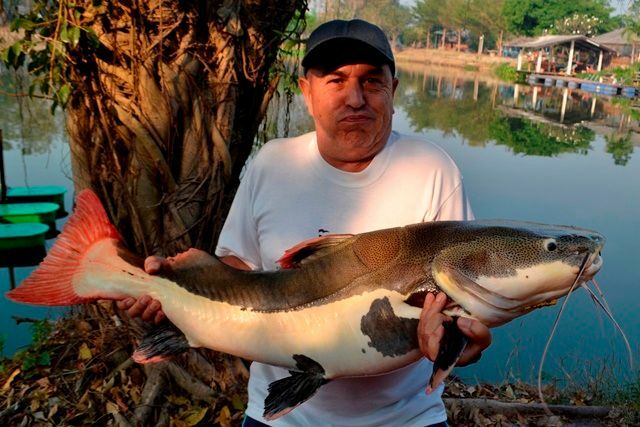 It was a tough day at the office for David Sandlin but he manage to catch some Amazon and Thai redtailed catfish in the end. It was a case of Amazon redtails galore for another of our Japanese customers. Another Japanese angler managed a few Amazon redtails in what was only a brief visit to Palm Tree.